Turkey is a country located on the border of the continent of Asia and Continental Europe. The state capital of Ankara has a very beautiful panorama. Historical places in Turkey's interest to visit and learn. There are also many tourist attractions in Turkey that you should not miss when visiting there. In addition, Turkey has a very tempting variety of culinary. Turkish culture and people-friendly which adds to the warm friendly atmosphere. Visit to Turkey could become a major alternative for those of you who want to spend the holidays with family and friends. There you will get an unforgettable experience with a wonderful holiday in Turkey. Hagia Sophia Museum located in Istanbul, the Hagia Sophia was originally a basilica constructed for the Eastern Roman Emperor Justinian I in the sixth century. A masterwork of Roman engineering, the massive dome (31 meters or 102 feet in diameter) covers what was for over 1000 years the largest enclosed space in the world. The church was looted by the fourth Crusaders in 1204, and became a mosque in the 15th century when The Ottomans conquered the city. 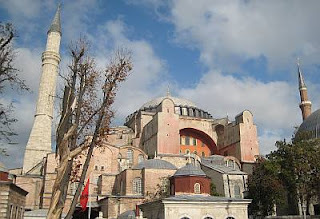 The Hagia Sophia was converted into a museum in 1935 and is now one of the top tourist attractions in Turkey. Blue Mosque, is one of the most beautiful mosques in the world. It's name is derived from the blue tiles decorating its interior. Its grace and beautiful proportions were intended to reflect the splendour of Islam. It was the supreme Imperial Mosque of the Ottoman Empire. 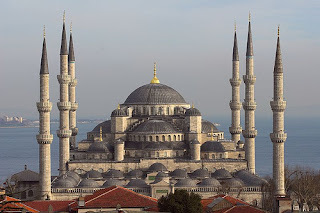 The Blue Mosque has also become one of the most popular tourist attractions in Istanbul. It was built between 1609 and 1616 and like many other mosques contains the tomb of the founder. Inside the mosque, the high ceiling is lined with the 20,000 blue tiles with different patterns. Pamukkale is one of the natural wonders of the world. It is a unique geological formation formed over 14.000 years. 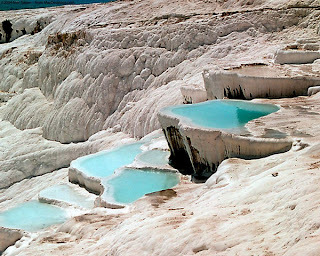 The spring water at Pamukkale has therapeutic qualities and since antiquity has been said to cure rheumatism, kidney and heart diseases. Pamukkale, meaning “cotton castle” in Turkish, is an unreal landscape in western Turkey, famous for its white terraces. The terraces are made of travertine, a sedimentary rock deposited by water with a very high mineral content from the hot springs. The ancient Greek city of Hierapolis was built on top of the hot springs by the kings of Pergamon. The ruins of the baths, temples and other Greek monuments can be seen at the site. And pamukkale become one of the top tourist attactions in Turkey. 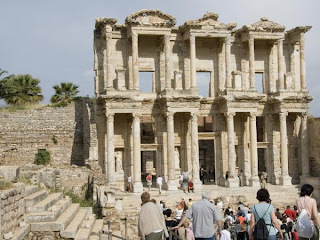 Ephesus is one of the best-preserved ancient cities in the world. It was an important trade and religious center. During the Roman period its population reached approx. 250,000. Temple of Artemis was in Ephesus. It is also the site of one of the Seven Churches of Revelation. St. Paul lived and preached for about 2 years in Ephesus. 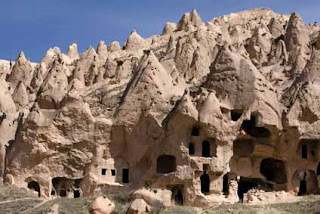 Cappadocia is famous for its weird and wonderful natural rock formations and unique historical heritage. One of the best places to see these strange formations is the town of Göreme, which is located among a large number of tuff cones, termed fairy chimneys. The fairy chimneys have been formed as the result of wind and water erosion of two different volcanic layers. It was the enchanting tourist attractions in tourkey. 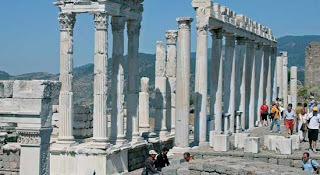 Pergamon was one of the Seven Churches of the Revelations. The famous Roman physician, Galen was born and studied in Pergamum.The ruins are separated into 3 parts, the Acropolis, Red Courtyard and Asclepion, which was the cure center of Pergamum. Aspendus has one of the best preserved and largest Roman theaters in Turkey. this turkey tourist attractions built in the 2nd C AD, during the rule of the Roman Emperor Marcus Aurelius and could seat between 15,000 and 20,000 spectators. Because the stage area was later used as a caravanserai (a roadside inn) in Seljuk times, it was continuously repaired and maintained. 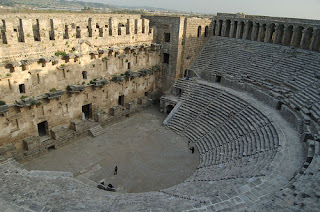 Thus, the Aspendos Theatre has been able to survive to this days without losing almost any of its original qualities. One of the most spectacular sites in Turkey especially at sunset. 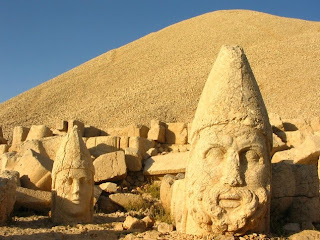 Mount Nemrut (approx. 2552m) is an extension of the Taurus mountain range in southeastern Turkey. The summit of Mount Nemrut provides a great view of the surrounding mountains. The main attraction is to watch the sunrise from the eastern terrace which give the bodyless heads a beautiful orange hue and adds to the sense of mystery of the place. 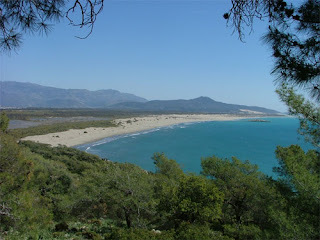 Patara is one of the longest stretches of sandy beach found anywhere in the Mediterranean. The beach is backed only by ancient Lycian and Roman ruins and swooping dunes with no buildings visible except of a small café. Patara Beach is also the breeding ground of the endangered Loggerhead turtle. Oludeniz is a small village located on the south west coast on the Aegean Sea. 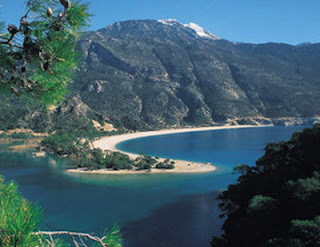 It has a secluded sandy bay at the mouth of Ölüdeniz, on a blue lagoon. This beach is famous for its shades of turquoise and remains one of the most photographed beaches on the Mediterranean. Oludeniz is also regarded as one of the best places in the world to paraglide because of its unique panoramic views.